This year, we are offering several options for CSA subscribers. Community Supported Agriculture programs, often known as CSAs, are becoming increasingly popular for farmers and their customers, but many who haven’t been exposed to them before aren’t quite sure what they entail. While there are as many options as there are CSAs, the general principle of all of these ‘box’ programs is the same. During the early spring months, members of the community sign up for the program, essentially making a commitment to purchase a certain amount of product from a farm in the upcoming year. The commitment they make is a financial one as well: shares are pre-purchased at the time of sign up, even though products don’t start arriving for up to five or six months. Why the delay? For farmers, some of our highest costs come early in the spring. This is when we are building needed infrastructure, purchasing seeds, putting in amendments, buying or breeding livestock, and generally preparing for the year ahead. Unfortunately, it’s also when income opportunities are lowest, as there is generally very little available to sell at that time. 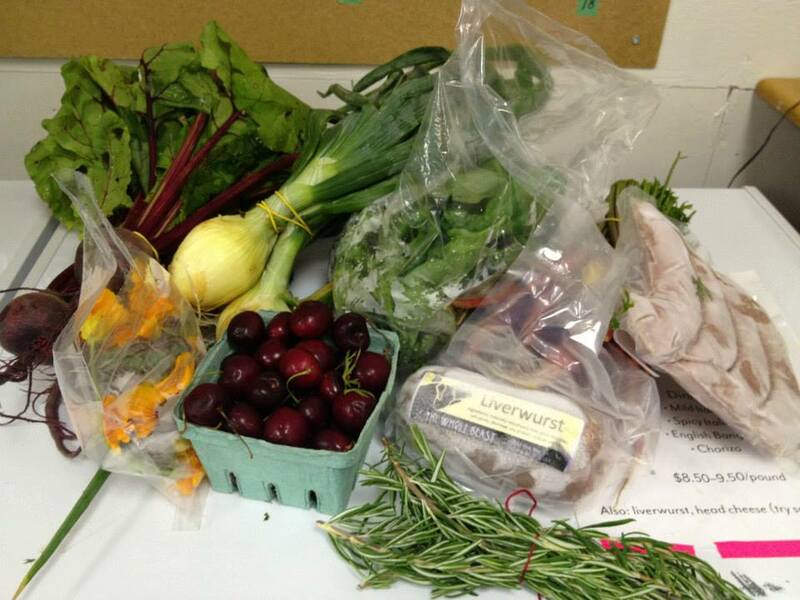 By buying in to a CSA, customers provide invaluable capital for farmers to start the season. Customers have pre-paid during the months when we have the most product available, and when our costs also happen to be lower. If a CSA is a large percentage of a farm’s sales, as it will be for the Alderley Grange this year, then knowing how many shares have been sold before it is time to plant, order, and plan is also extremely important and helps us to provide our customers with the best-possible products over the course of the season. On the other hand, customers go into the summer knowing they will receive local, in-season produce all season, and that they will have the opportunity to get to know their farmers and food producers well. It’s a great chance to learn what is in season at any given time and to learn some new flavours and recipes. CSAs tend to provide the classics—carrots and potatoes—and the unusual—lovage and edible flowers—which lends itself to a varied experience from week to week. 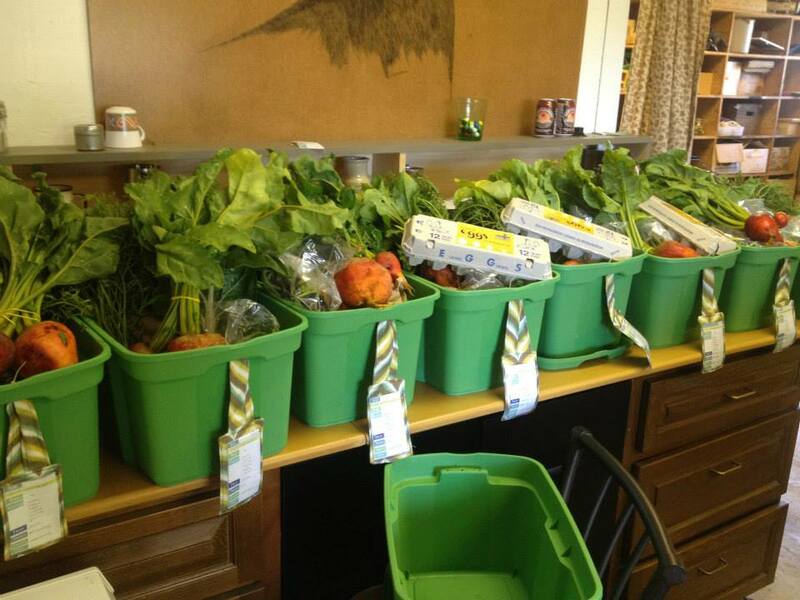 The average CSA tends to provide a box of vegetables each week. Sometimes these come with a recipe, and sometimes you have the chance to add something like a dozen eggs. Some larger farms, such as Essex Farm in New York State, are able to provide fruit, vegetables, meat, dairy, grains, maple syrup, and more to over 200 members, while others offer far more limited choices designed to supplement your weekly trip to the store. At the Alderley Grange, we fall somewhere in between, and are also passionate about making our Goody Boxes a fantastic—and unique—experience for our customers. Other options include our Veggie-only box ($24/week; $480/season), and based on popular demand, an ‘everything-else box’ for members who grow their own vegetable gardens but want to enjoy local protein and goodies ($27/week; $540/ season). We are also excited to be starting a monthly protein box this year, which will run from June–December and includes 12–13 pounds of meat each month, as well as a whole turkey for either Thanksgiving or Christmas. Members of this box can expect to enjoy pork, beef, lamb, turkey, duck, and some more unusual meats like bison or venison, knowing that everything they are consuming has been pasture-raised on organic feed, without any added hormones or antibiotics by small-scale growers here on the Island. ($160/month; $960/season). As much as possible, all box products come from us here at the Alderley Grange on the Saanich peninsula, but when we need to supplement from another farm, we make sure it is local, organic, ethical, and farmed with love. The bottom line is that our CSA customers get some of the best produce around, and have the opportunity to form a relationship with the source of some of their family’s food at the same time. Registration is now open, so consider supporting local food and guaranteeing your weekly or monthly share of some truly amazing food and goodies! 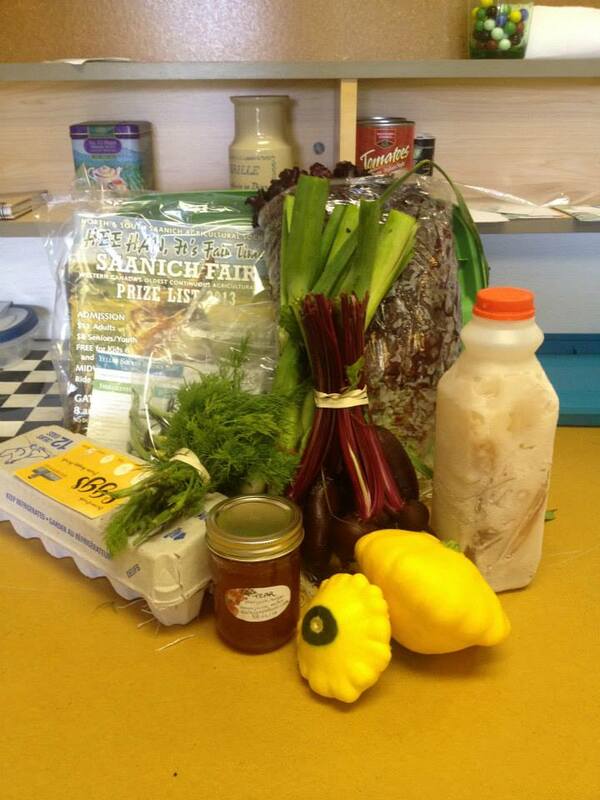 This entry was posted in Blog, Food and Recipes, Goody Box CSA and tagged alderley grange goody box, community supported agriculture, CSA, farming, local food, NaBloPoMo, produce, Vancouver island. Bookmark the permalink. The CSA is a good arrangement for both parties. I don’t suppose you ship to IA. That means I need to look into a supplier locally, huh? Good luck and may your harvests be bountiful. Alas, shipping to Iowa would make it a not so local endeavour… I bet there are farmers doing something similar in your area – feel free to post links here- you never know who might be reading. Yes there are. It is pretty wide-spread. Here is a link. There are a lot of local farmers who do this. We talked about it last year but it wasn’t going to fit well into our schedules, as we knew we’d be gone for some longer stretches. This year it might make sense. Thanks for the summary and reminder. We’ll be looking into it. Post a link to the farm you choose – it would be great to see what they are offering… I love poking around on other farm websites to see what their CSAs are like. There are about as many variations on the theme as there are farms! I love the CSA movement and I think they should be utilized in every town or city.